God Krishna or Krishn Bhagwan is one of the most important figure of Hindu religion. He is the eighth and "complete" avatar of Lord Vishnu. 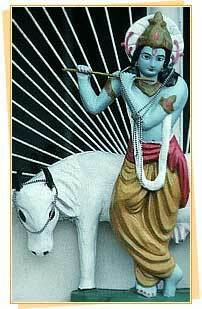 Krishna was also a central figure in the who was there in the battle of Mahabharata. It is this belief and popularity that there are many famous Krishna temples dotted all across the country. These Krishna temples are known by different names like Radha Krishna temple, Hare Krishna temple, Hari Krishna temple, Sri Sri Radha Krishna temple or Hare Rama Hare Krishna temple there are so many names for them just like Krishn himself. It is a popular Krishna aarti that will arouse deep devotion in you.